Nearly a decade in the making, A&M Corner is proud (and somewhat relieved!) 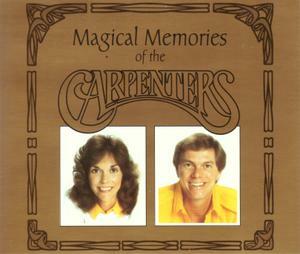 to present The Complete Carpenters Recording Resource! More than just a discography of Carpenters recordings, the Resource goes in depth, song by song, analyzing the mixing and overdub differences between all of the released versions. 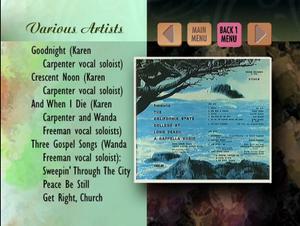 For many years, Carpenters fans have been confused as to which versions of these tracks appear on which album releases. With at least two released versions of each album, along with dozens of anthologies and compilations, the choices are overwhelming. Thanks to many long and critical hours of listening, members of our staff have analyzed and debated each recorded version of every song to report their findings to the A&M Corner membership and the Internet-at-large. The bulk of the listening sessions were conducted by Harry and Chris, with occasional assistance from other staff members when they needed another set of ears to confirm their findings. In addition to a search function, the site also features a mobile view that is easily navigated on your smartphone or tablet of choice! Very handy for those "record crawls" while you're out shopping for these recordings at your local record/CD retailers. Each entry can also be shared with your favorite social media service, including Google+, Twitter, Facebook, and dozens of other popular services. This site is step one of a complete makeover of A&M Corner. We currently have other sites in progress, including the main A&M Corner site itself, and will announce each as they are ready. Until then, enjoy the new Carpenters site, and we look forward to getting feedback from everyone as they begin using the new site. And as I publicly thank Harry and Chris May for putting so many hours into this project, I urge others to do the same. This long-overdue project is now in your hands to utilize and enjoy! June 13th was the perfect day to launch the new site, incidentally: on June 13th, 1972, the Carpenters album A Song For You was released. A great way to celebrate the album's 40th anniversary! Thank you i have most of the carpenters basic albums on cd mostly 30th anniversary issues but i will check it out i look forward to seeing all the hard work and loving care you all put into it congrats my friends. What a joy! You can see the hard work you put in. As a lifelong fan, thank you. WOW!! What an incredible surprise. It was certainly worth the wait. THANK YOU! Thank you, thank you thank you. Your hard work shows and you have done an amazing job! What a tremendous resource for all of us! Thank you so much! I love it! Despite it being "launched" and seeming "finished," the site will always be a work in progress. Chris has some more studio insight to share for certain albums or songs, and of course, there will always be corrections and new additions as the Carpenters reissue machine keeps on churning around the world. We do plan on adding more content so it is not simply an "albums and songs" site, and the nice part is, our publishing platform allows us to quickly add new content without needing much in the way of technical assistance. For my part, I do all the nuts and bolts stuff behind the scenes, trying to make everything work properly and look nice, and also making it easy for contributors to work on the content. That was a huge hurdle in the past! I had originally started a system to catalog the information in a raw database, then pull out data as needed. Just the backend alone was a huge undertaking: trying to make it easy (user friendly) to enter information, format the data properly, use all sorts of error trapping on the entered data, wrap it up in security measures, and hopefully keep it non-technical enough so anyone would be able to contribute. And that was just the private side! In reality, displaying the data is a lot easier...but while this method would still be ideal, it would entail dozens upon dozens more hours of work to even make it possible. In contrast, I was able to install and setup a fully functional WordPress Multisite system in about 30 minutes. TICKET TO RIDE-Two release dates are listed here:November 15,1969 and October 9,1969(Chris May). I do believe 11/15 was the actual release date. CHRISTMAS PORTRAIT-the album notes state that Richard & A&M elected to combine "Portrait" and "Old Fashioned Christmas" together as the "Special Edition" CD.This is inaccurate-the decision for one disc was made by A&M.The compact disc was in it's infant stage back in 1984 and A&M(and every other label) didn't know how well CD's would sell.The "Special Edition" was concieved by A&M as a "test" disc-while taking advantage of the CD's 70-minute capacity.If A&M knew in 1984 what they eventually found out by 1987,they would've put both Christmas albums on CD individually. VOICE OF THE HEART-the album notes state that "Now" was the only new recording on the album-the rest being outtakes from other albums.This is inaccurate-"You're Enough" was recorded during the same session as "Now" in April 1982. LOVELINES-"You're the One was released as a single in early 1990-this is not mentioned in the album notes under "singles". Thanks for the info mr J. We'll take all of that under advisement. Thank you for all the incredible hard work and detail in putting this resource together! This is helping me immensely to sift through all of the various remixes and such. I would like to submit a correction and additional info on the song "Bless The Beasts And Children". In the 1990 remix each time just before they sing "light their way when the darkness surrounds them" there is a prominent upward harp glissando in the right channel. These glissandos are completely absent in the 1985 remix and this is one of the quick and easy ways I can tell which remix I am listening to. These glissandos are another marker that defines the difference between the original album mix and the original soundtrack version (though less obvious than the English horn vs. vibraphone at the beginning and ending). The original soundtrack mix contains these glissandos, less prominent than the 1990 remix and panned slightly left. The original album mix, like the 1985 remix, omits these glissandos altogether. Give it a listen - I think it's a lot of fun finding these differences! Thank you for pointing that out. I'll correct that entry momentarily. In fact, while investigating, I believe I've spotted another error on this same song. I had YESTERDAY ONCE MORE (98) listed as being the 1990 remix and now it sounds to me as if that one is also the '85. This is exactly why I wanted others to listen - more sets of ears will hone this thing down to perfect. Yes Harry, you are correct that the YESTERDAY ONCE MORE (98) version of "Beasts" is indeed the 1985 remix and not the 1990. I just gave mine a listen and it's definitely the 85 remix. Here is an addition to the discography for your consideration. 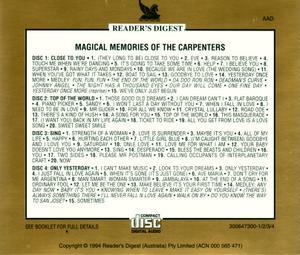 The 1993 MAGICAL MEMORIES OF THE CARPENTERS UK 5-CD Reader's Digest set was released the following year in Australia as a 4-CD set. The track listing is the same only it is split differently to accommodate 4 discs instead and discs 2-4 are named differently than the UK set. This set came with a 20 page booklet (I assume the UK version did as well). Here are the front and back covers followed by how the tracks are sequenced on each disc. 2. I Can Dream, Can't I? That's interesting that the Australian release was exactly the same tracks but split differently among 4-CDs instead of 5. It was probably a cost-saving measure to reduce the price of the set, I would imagine. Since it's a variation, it at least deserves a mention. Do you have the catalog number? There are two numbers on this set and I'm not sure which one qualifies as the catalogue number. Above that and to the right is the number 300647300-1/2/3/4. These numbers are also on the CDs. Both sets of numbers can be seen in the tray card image if you click on it. Here is a correction and some info on the song GOODNIGHT. The recording resource lists this song as GOOD NIGHT but on the From The Top CD and on the original private Lp from which this song was taken it is just one word GOODNIGHT. This song was taken from "REMEMBERING" - a private issue LP recorded in 1969 by The California State College At Long Beach A Cappella Choir (Young LP 8402). This album was produced by Richard. It is worth noting that the version released on From The Top is not exactly the same as the one on the Remembering LP. In the original version on Karen's last line she inadvertently sang "Now the sun begins to shine" which of course makes no sense when followed by the line "Goodnight, sleep tight". For the From The Top version Richard replaced this mistaken line by copying and editing in Karen's line from the 2nd verse which was "Now the moon begins to shine". Th original version as well as the other two songs on this LP that featured Karen as a soloist can be found on various bootlegs (and probably on YouTube). I know we're not counting bootlegs and unofficial releases here but since this was officially issued (privately anyway) and is listed in the Discography section of the "Close To You: Remembering The Carpenters" DVD I thought it might be worth inclusion in the Recording Resource. There are bound to be a few (probably very few) copies of this LP still in existence. When we did similar private issue LPs in high school and college for choir, orchestra or band the pressings were usually just a few hundred or less, so assuming the case is the same for the Remembering LP then this album would be an even rarer find than the Magic Lamp single. I'm torn here because the song is of course originally from THE BEATLES (White Album) and there it is listed as "Good Night". This is akin to another famous error on printed A&M albums that for years insisted that Sergio Mendes & Brasil '66's first hit was called and spelled "Mais Que Nada." It's since been corrected as "Mas" but those original albums with the misspelling are out there in force. So I think it's prudent to leave the spelling with two words, since that's how The Beatles intended it to be written. I used the same logic in putting the exclamation mark after "Help" even though none of the Carpenters albums/discs used it. It just made more sense to me at the time - maybe I'm misguided, I don't know. But how "Good Night" is mislabeled on a private-issue school album shouldn't be the determining factor, IMHO. Bottom line is no-one will be confused by it, I don't think. Thanks for the info on the catalog number on the MAGICAL MEMORIES. I was hoping that perhaps something on the spine would fall more in line with the UK issue numbering. 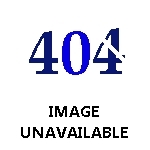 I found another element that distinguishes the 1985 mix of Bless The Beasts And Children from the 1990 mix. It is during the outro where Karen and Richard sing "the children" three times. In the 1985 mix the breaths to these lines can be heard. In the 1990 mix the breaths have been removed. Also distinctive in this same section: in the 1985 mix Karen's high harmony line (I think of it as the "melody" line) is further back in the mix while her harmony a third below it is more prominent. In the 1990 mix the high harmony line is heard more distinctly and all the harmonies sound more balanced. Richard must have continued to like the "no breaths" scenario as the 2004 SACD mix also has no audible breaths. Thanks for the added tidbits. I've added a note in that song on the Resource. Great site. Bookmarked for later viewing. I have a few significant revisions to submit to the list and they all revolve around the Japanese Anthology 4-Lp (later CD) boxed set. The original 4-lp boxed set with the red cover (photo below) was released in 1985, not in 1989 as is stated here and in some other sources. I remember that this set appeared as an import at Tower Records at almost the exact same time as the 1985 US Yesterday Once More 2-Lp set. The Yesterday Once More set which included so many new remixes was not issued in Japan when it first came out. 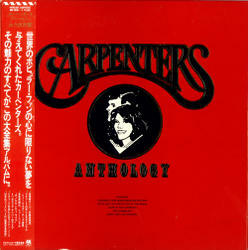 Given the Carpenters' extreme popularity in Japan it seems highly unlikely that they would be deprived of all these new mixes, and it is my conjecture that Yesterday Once More was not issued in Japan as a set in 1985 because they were concurrently working on the 4-Lp Anthology set which would feature many of these remixes. "Honolulu City Lights" and the "Bacharach/David Medley Live" made their very first appearances on this Anthology set. Because the entire liner note booklet was in Japanese there was no info that I could glean from the set about these two tracks so I decided to go right to the source and wrote a letter to the fan club. On November 5, 1985 Mary Carpenter personally wrote me back answering my questions about these two tracks on the Anthology set. I am including a photo of this letter below. Click on it to see a very large version of it that you can read. 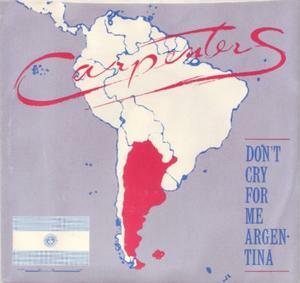 SIDE NOTE: The answer to question #3 was in regard to a picture sleeve single that I had seen in a record store of Calling Occupants b/w Don't Cry For Me Argentina that featured a picture of North and South America. I was partly right in that it did feature South America. It turned out to be one of the A&M reissues and was a domestic release but Richard had obviously not seen this picture sleeve which explains why they thought that it was definitely not a domestic release (photos below). This remix also appeared on the 1987 Japanese "Treasures" 2-CD set. Having believed that Anthology was from 1989 it was assumed that "Treasures" is where this remix first appeared and has been listed everywhere including the CRR list as a 1987 Remix. However, its first appearance was on the Anthology set in 1985, so this remix should be listed as a 1985 remix. It should also be noted that in this mix the line "I've acted out my love in stages" is a different take from the original mix. In the remix Karen uses vibrato on the word "love" where she does not in the original mix. This is not mentioned on the CRR list. This "middle length edit" which features the piano segue into Ave Maria is listed in other sources as a 1989 remix because its only appearance is on the Anthology set which was mistakenly believed to be issued in 1989. It is, however, from 1985. The CRR does not give any date on this edit, just that it appears on Anthology (89) which should be Anthology (85). So everywhere in the CRR list where "Anthology (89)" is listed it should read "Anthology (85)". I hope this is clear and helpful. Let me know if something isn't clear of if you have any questions. Thanks "CloseToYou10". I'll take this all under advisement and check around. While your arguments are compelling, and I'm sure you're correct about some of this stuff, without actually hearing what's on the LPs, I personally cannot confirm that the mixes are identical with what's on the CDs, which did indeed come out in 1989. Something I've learned about Carpenters and their mixes is never to take ANYTHING for granted and to use my ears to confirm everything. I'm guessing that you own the ANTHOLOGY red-cover LP set? Is there a date anywhere on the LP set to confirm 1985? 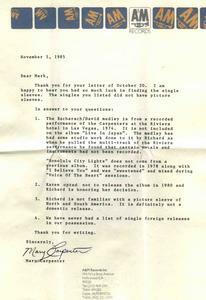 I can see the date on the letter you posted, but it never mentions "ANTHOLOGY" anywhere on it. I don't mean to sound doubtful, I'm just being cautious before blindly changing the database. Get back to me to discuss this some more. Of course you are wise to be cautious before changing the database as there is a lot of information along with a lot of misinformation out there. I indeed did own the Anthology red-cover LP set but sold it with some of my other LP collection about 10 years ago. I only ever owned the LP set and not the CD version so I can't speak for what the 1989 CD set had on it but your descriptions are identical to the LPs. There was absolutely no date on the LP set that I recall. Everything was in Japanese except for song titles along with both English and Japanese song lyrics in the 28 page LP sized booklet. 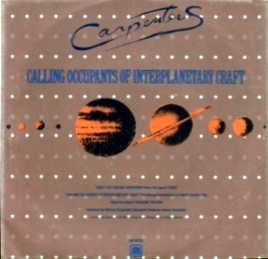 In the 1980s the older Japanese Carpenters LPs and singles were very hard to find. Most of the albums were limited pressings, then they'd make a new and different collection with a limited pressing and so on and the list was extensive. By the late 1980s and early 1990s CDs had finally established themselves and a whole slew of the Japanese LPs became available on the used market and that's when I obtained most of my own Carpenters Japanese LP collection. However in 1985 when Anthology was issued I had none of the LPs including Live In Japan and even that was a rare (and expensive) find at the time. I wondered if the Carpenters has released some things on some of the older Japanese albums that they hadn't issued in the United States (other artists had done this on foreign releases so why not the Carpenters?). I thought that perhaps the Bacharach/David Live medley came from the "Live In Japan" LP and that was one of my questions to Mary. And since I had never heard of "Honolulu City Lights" before this was also one of my questions to Mary: "Was Honolulu City Lights from some previous Japanese album?" Her answers to both these questions are in #1 of the letter photo. As for the answer in #2, I asked her why Karen's solo album had not been released. There was never a satisfactory answer in any of the fan club newsletters and Mary's answer wasn't any better, but that's what #2 is about. #3 I talked about in my previous post. Wanting to find out more about the vast number of foreign single releases that were out there, I asked her if they had some kind of list regarding them and her answer to that is #4. The most compelling argument that I have to offer is that both "Honolulu City Lights" and the "Bacharach/David Medley Live" both made there first appearance on the Anthology set. If this set was not issued until 1989 then why would Mary be discussing them with me in 1985? Remember, there was no internet then and no one had ever heard of these tracks before Anthology was issued. And though there is no mention of Anthology specifically in the letter from Mary, that set was the reason for me writing and asking those questions in the first place. I also submit that in the 1987 Japanese Treasures liner notes for "Slow Dance" Richard says: "Our version was recorded in 1978 during the same session that produced "Honolulu City Lights". Why would Richard reference a song that no one had ever heard of and that hadn't been released yet (assuming it didn't come out until 1989 on both Anthology and Lovelines)? "Honolulu City Lights" made its debut in 1985 on the Anthology re-cover LP set and then was released in the US as a single b/w "I Just Fall In Love Again" in 1986 as part of the A&M records "Memories" series (AM-8667). Given this, Richard's mention of the song in the 1987 Treasures "Slow Dance" liner notes then makes sense. In addition, here are some links to websites that support that 1985 date of the Anthology LP set (sorry if these are not allowed here but I don't know of any other way to get them to you). These next two are also from people who have sold the collection. Both give the 1985 date. In the first one the seller says "Purchased new by me and stored safely in my Carpenters collection ever since." Lastly, you are right about confirming everything with your own ears. All I can say is that what you have described in the CRR list about the mixes on the Anthology (89) CDs are exactly the same as what was on the 1985 LPs. There must be someone here on this forum who still has the LP set and can verify what I am saying or make copies of the vinyl tracks so that your own ears can hear and compare. Yes, I freely accept that ANTHOLOGY was issued in Japan on LP in 1985, which certainly places the medley and "Honolulu..." as 1985 releases - but they are not really what concerns me as those two aren't involved in remixes. My biggest concerns are the three remixes you mention in your earlier post. The whole history of ANTHOLOGY is rife with examples of song mixes that changed from release to release, and I'm speaking here about the '89 edition on CD and the '97 edition on CD. The liner notes are even wrong on the '97 edition, parroting some things that were true in '89. And segues that happened in '89 were abandoned in '97. So that's why I'm not jumping to make any changes here until I can verify them. Finding a copy of the LP set for anything close to reasonable pricing looks to be a long shot. So if there are indeed any members here with the LP of ANTHOLOGY, please weigh in with your info and we'll see what we can come up with. But I really appreciate both the passion and the research you've provided. Hopefully we can get it ironed out.